A Small Size, Colorful, Visibly Aged And Well Made Caddoan Culture Hayes Point That Exhibits Surface Oxidation Aging And Overall Stone Patination, Correct Style Flaking, Correct Style Base And Form, Overall Aged Deposits, Aging At The Stem Notches, Correct Material And Manufacture For The Area Found. Ex-Jim Bennett Collection. Found Near The Sulphur River, In Bowie County Texas. 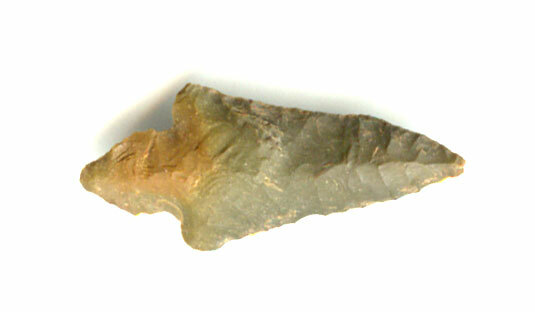 These Type Hayes Points Are Often Found In A Cache Of 7 Or More Along With Red River Focus Caddoan Pottery. This Example Possibly Is In As Made Condition, Being One Of A Ceremonial Cache Point. Includes A Ken Partain Certificate Of Authenticity.